Within the complex project to enhance the financial literacy of the population of Ukraine started in 2012 by the National Bank of Ukraine, the second meeting of the representatives of the academic community with the Deputy Governor of the National Bank of Ukraine took place in the Mirror Hall of Ivan Franko National University of Lviv on February 11, 2016. This time Dmytro Solohub visited the University. The Deputy Governor of the National Bank of Ukraine told about the changes in the monetary policy of the Central Bank. “Under the previous regime of the monetary policy the fixation of the exchange rate was a sweet illusion of stability for which Ukraine paid a high price by international reserves and a sharp deterioration in the welfare of the population”, – he believes. Therefore, the National Bank is going to announce the transition to another regime – inflation targeting aimed at providing the price stability till the end of 2016. “Targeting of the level of inflation is not a panacea but it is the regime that proved its efficiency in the countries similar to Ukraine in terms of functioning conditions”, – Dmytro Solohub noted. The Deputy Governor of the NBU informed that the Central Bank had already begun to move in this direction. “The changes in the system of making decisions and communication policy took place. 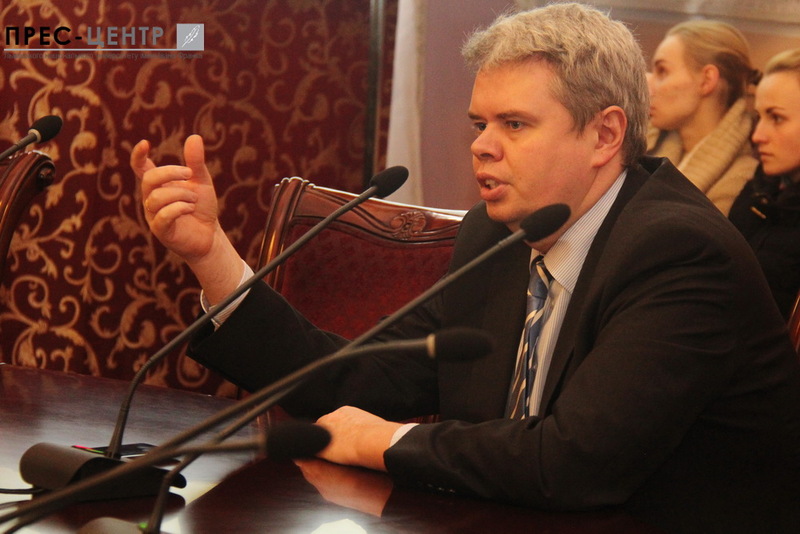 Simultaneously the process of cleaning the banking system and developing financial markets which are supposed to increase the influence of a new model of the monetary policy of the NBU on the economy is in progress”, – Dmytro Solohub told. According to the Deputy Governor of the National Bank, the principal challenges at the stage of the transition are microeconomic instability, low trust in public authority, a high degree of the monopolization of economy, the lack of effective coordination between monetary and fiscal policy. “But the new regime will be able to function fully only after structural changes in the economy as well as after refocusing public expectations from the exchange rate to the price level”, – the Deputy Governor of the NBU was convinced. The lecture of Dmytro Solohub evoked a great interest among the students and lecturers of the economic specialties who took part in the lively discussion of topical issues for our society. At the end of the meeting with the Deputy Governor of the National Bank, the Dean of the faculty of economics Rostyslav Mykhailyshyn thanked Dmytro Solohub for professional discussion and sincere answers to sharp questions and expressed the hope to deepen the cooperation of the NBU with Ivan Franko National University of Lviv. “We are pleased that Lviv University is a good platform for open dialogue and interesting discussions of the students and lecturers with the representatives of the National Bank, public authority, diplomatic corps, business and foreign experts”, – Rostyslav Mykhailyshyn added. We should remind that the meeting of the Deputy Governor of the National Bank of Ukraine Yakov Cmoliy with the students of the Faculty of Applied Mathematics and Informatics of Ivan Franko National University of Lviv took place in the Mirror Hall of the University on September 4, 2015.